P1: Desperately seeking to attract the attention of the giant princess, John Carter leaped from the top of a building to the girl's head. P2: He tangled his hands in her hair and swung down beside her ear. Then he shouted. P3: But Carter's voice was lost in the crash of falling buildings, for Woola was running wild, confused by his own sudden growth. P4: The girl's brain had not yet cleared from the effects of Vovo's Z-ray. Dazed, she sought water to cool her parched throat. P5: Within the city was Vovo's reservoir. Dejah Thoris threw herself down beside it. P6: Carter's hold on her hair was slipping as the girl splashed the cooling waters upon her face. P7: And when she lowered her head to drink, the Earthman was washed into the churning waters. CHAPTER 37: "A DIZZY RIDE"
Eo is a very old city. There was a small port on the island before the Martian seas dried up and it became a plateau. That port was built by the white race when Horz was yet sending its fleets to ply the five oceans of ancient Barsoom, but it eventually crumbled to rubble and was forgotten. In its place, a short distance away, the city of Eo eventually sprang up, obliterating forever the last forest nests of the six-limbed green species. It is perhaps incorrect to call the collection of buildings that Vovo ruled over a "city." More correctly Eo is an expansion of the tiny settlement that grew up alongside the first Atmosphere Plant -- a settlement never open to the knowledge or inspection of the red planet's other inhabitants. From times of great antiquity its only denizens were the mechano-men and their wizard masters. The metal men continue to tend the primordial forests of the plateau, watering them with precious liquid pumped from deep below the surface of Mars. A by-product of this supervised irrigation is to be found in the little lake located between the urban center and the ruins. The lake is an artificial basin of great antiquity and it is one of the few bodies of water left uncovered on the dying world. In her rambles to and from the city the giantess spotted this inviting pool and it was to its banks she directed her steps after looking over the silver tower and losing interest in its featureless walls. Meanwhile John Carter had leaped from the top of that same tower to the girl's head and there he had narrowly avoided being crushed to death by a random swat of her immense hand. Breaking his fall, the man tangled his hands in the maiden's hair. Each strand was the size of a rope to him and used these to swing himself down beside her ear. Then he shouted words of greeting to her, in deep, low tones imitative of her own rumbling voice. But Carter's utterance was haplessly lost in the thundering roar of a falling building. Woola had displayed extraordinary patience for a calot, waiting in the plaza as directed by Dejah Thoris. When he saw her leaving the city he naturally bounded up to her side, knocking over one of Eo's older masonry structures, and it in turn, crashed into two steel-ribbed buildings. They withstood the impact but the horrible crashing and reverberation drowned out Carter's words completely. Again the girl swatted the little irritation on the side of her head and again John Carter jumped for cover in her long tresses. More and more her reasoning powers were sorting themselves out in the girl's transformed mind. It suddenly occurred to her that in her youth she had been called "Dejah," but she was not yet able to recall who it was who gave her that name. Instead of following up this important realization, the giantess sought water to cool her parched throat. With Woola scampering at her heels she made a path through the breast-high trees to the wizards' reservoir. Dejah Thoris threw herself down beside the inviting pool and splashed the cooling waters upon her face, while Woola circled round, leaving his many footprints in the soft earth along the water's edge. The Virginian's hold in her smooth hair was a precarious one at best and he felt it slipping as the girl splashed copious quantities of water upon her face and locks. When she lowered her head to drink, the Earthman was washed into the churning waters of the reservoir. More than anything else that day, it was seeing her own reflection in the water of the Pool of Eo that jolted the maiden's suppressed memories. Gazing at that perfect face with its deep red skin and dark brown eyes, Dejah Thoris was reminded of her own mother and with that reminiscences came a flood of thoughts, filling up the vacant spaces in her altered consciousness. "How silly of me, to forget even who I am!" she blurted out. And then, right after that: "Woola, where is Dotar Sojat?!" The dumb beast lifted his head in recognition of his master's name, but he could only offer whines and yelps in response. More and more herself with each passing moment, the princess probed the calot's thoughts with her own magnified perception, but all she could fathom was that the Jasoomian must be nearby. She had last seen him in the city -- or was it in Vovo's laboratory? And what had become of Vovo? "Something very strange has happened to us, Woola," she said, again speaking to the unanswering beast. But, of course, he could neither understand nor answer her. "Look at the trees! How small they are! And in the water, the bubbles are so tiny. Can it be that the entire mountain has shrunk to the size of a hill? No, that does not explain the size of the bubbles and the minuscule ripples along the water's edge. Woola! We have grown -- we are giants! What a nightmare is this!" Oman, accompanied by fifty of the mechano-men, sought the Princess of Helium. Around his neck was slung Vovo's microphone transmitter, now fully operative again. He found it useful in directing the movements of his men from a distance, but the Odwar of Eo was especially eager to try using the device to communicate with the giantess. Before his death the wizard had improved the apparatus so that it did more than simply send wireless signals to mechanical brains. Vovo had foreseen the need to communicate directly with the expanded mind of the victim of his experiments and the microphone could now theoretically provide that crucial link. At least Oman hoped it would. 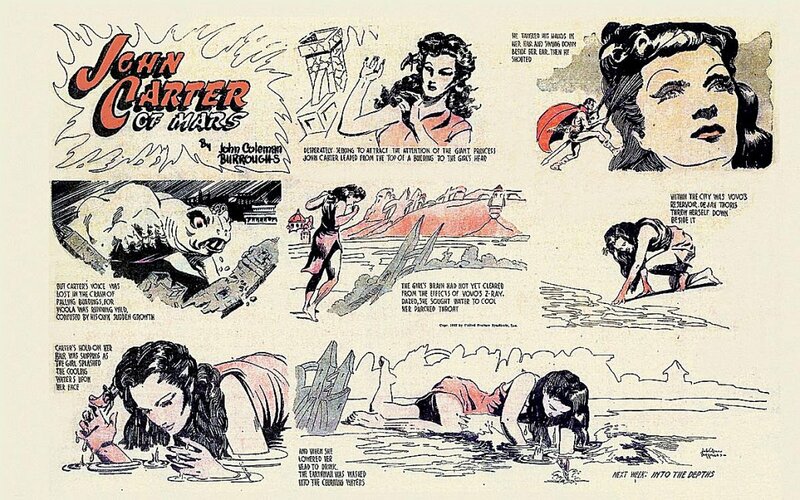 John Carter had exercised his earthly muscles in running and leaping on the red planet, but this was his first opportunity to try swimming. Indeed, he had not seen so much water all in one place since he and Powell had crossed the Gila River back on Earth. His powerful arms and legs propelled him rapidly through the frigid fluid, which was still covered in places with a paper-thin layer of ice from the night before. All the while he continued his attempts to project his thoughts to the mind of the red princess. He was unprepared for her first response when it finally came. "John -- I sense that you are near. I cannot see you. Has your size also increased? Oh, Dotar Sojat, where are you?" Oman and his troops arrived near the princess. Across the space that separated them the mechano-man saw the princess, turning her uncomprehending head to and fro as though she were searching for something. He would have to come nearer to use the microphone effectively, but the Odwar of Eo was wary of the dangerous calot. He and his men approached the transformed girl very slowly, keeping an escape route open in case the calot charged them. At the rear of his column two large robots carried special powerful rifles -- he hoped they would never have to fire them.